The monthly meeting to introduce the Universal Peace Federation (UPF) was held last night in the UPF-UK HQ in London. It featured a number of UPF friends and Ambassadors for Peace discussing informal partnerships for campaigns or conferences in areas of common concern. Charlotte Simon, Founder of Mothers of Congo, spoke of her appreciation of UPF through working together to raise awareness of the suffering of the people in eastern Democratic Republic of Congo. While Robin Marsh spoke of the activities of UPF, Margaret Ali explained the peacemaking principles that guide and inspire those activities. These principles include God being the loving parent of all humankind. This endows all of God's children with equal and sacred value and an inherent level of family obligation to human relationships. The universal principle of living for the sake of others is a source of joy, passion and inspiration for those who practice it. Through partnerships that exhibit this value we can become bigger both in our capacity and our consciousness. Aziz Al Naib spoke of driving to Iraq with humanitarian supplies. 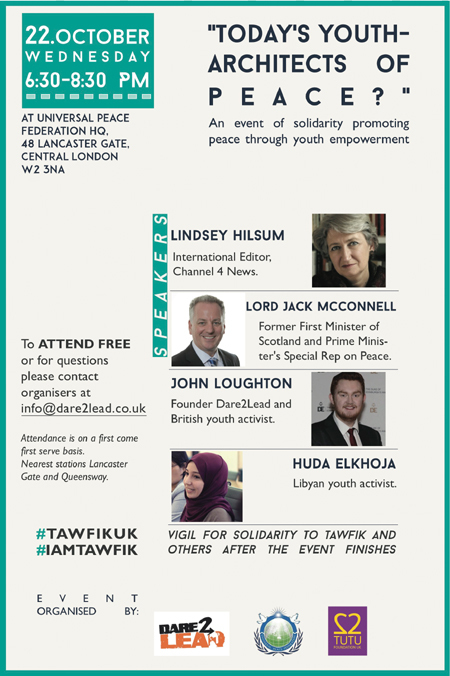 John Loughton raised the upcoming event (see the poster below) 'Today's Youth - Architects for Peace' in memory of the popular young peace activist, Tawfiq Bensaud, who was killed in Benghazi, Libya. Baldev Singh spoke of the work of 'Near Neighbours' and how standards of best practice should be established in inter- community relationship building. The tragic situation of the Kurdish people in Syria was also discussed. The meeting ended with a silent prayer for all these issues.